You can contact Musselman Library's Copyright Committee at library_copyright@gettysburg.edu. The committee will offer a recommendation based on your situation, but the committee does not provide legal advice or serve as a substitute for consultation with competent legal counsel on matters regarding compliance with copyright law. This guide presents an overview of copyright law with an emphasis on the ways it might pertain to the work of Gettysburg College students, staff, and faculty. Members of Musselman Library's Copyright Committee prepared this guide based on their collective interpretation of and experience with copyright, fair use, and other intellectual property issues; however, they are not lawyers. The information contained here is not legal advice, and consulting this guide is not a substitute for speaking with legal counsel. 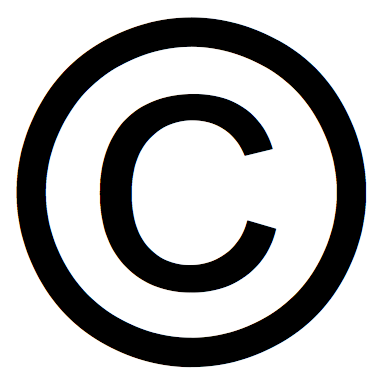 Even if you don't see a copyright symbol on something it might still be protected by copyright law. You do not need to register a copyright to receive copyright protection. Under U.S. law, any original work is protected "the moment it is created and fixed in a tangible form that it is perceptible either directly or with the aid of a machine or device." Patents and trademarks, like copyright, are forms of "intellectual property." A patent gives the inventor(s) of a utilitarian device (e.g. a tool) or process (e.g. a chemical formula) the exclusive right to duplicate that invention's design. Anyone seeking a patent must submit their design and detail what makes it unique. A trademark is a word, phrase, or symbol (e.g. a logo) identifying a product, service, person, or company. Registering a trademark prevents others from using the mark without permission or from creating a similar mark meant to confuse the public. Though having undergone major revisions, notably in 1909 and 1976, the U.S. copyright law endures today and continues to apply to works fixed in any tangible medium of expression. Many of the law's provisions are limited in certain circumstances and the educational environment is one of the most confusing areas where copyright can be applied. Essentially, it is illegal for someone other than the copyright owner to exercise these rights without first securing permission, although there are limitations and exceptions intentionally written into the law. What gets protected by copyright? Section 102 of the copyright law affords protection to "original works of authorship fixed in any tangible medium of expression, now known or later developed, from which they can be perceived, reproduced, or otherwise communicated, either directly or with the aid of a machine or device." Copyright protection does not extend to "any idea, procedure, process, system, method of operation, concept, principle, or discovery" that may be included in a protected work. Only the expression is protected, not the information analyzed or the ideas expressed. Some common examples of content not protected by U.S. copyright law include titles, facts, and professional works produced by federal government employees. How long do copyright protections last? A work created today would remain protected by copyright law until 70 years after the death of the author or creator. If the work has a corporate author then the protection would last until 95 years after publication or 120 years after creation, whichever is shorter. When copyright protections expire, the work becomes part of the public domain and is free to use by anyone. You can learn more about the public domain by using the tab above. You can contact Musselman Library's Copyright Committee (library_copyright@gettysburg.edu).